Sometimes it seems like everyone is obsessed with getting leaner, losing weight, and burning more fat. But what if you want to do the opposite? What if you want to gain weight? (Lean muscle, that is.) It's a lot harder for women to find information about that! In general, the male body produces far more testosterone than the female body. And since testosterone is what helps kick muscle building into high gear, you might wonder if it's even possible for a woman to gain an appreciable amount of muscle. It's not only possible, it's one of the best things that you can do for yourself! Building lean muscle increases a woman's functional strength, metabolism, and insulin sensitivity—and it'll help her resist fat gain in the future. All in all, gaining weight in the form of muscle can be a far better way to go about achieving the body you desire then simply trying to lose weight. To help get you get started with this goal, IFBB Bikini pro, Bodybuilding.com-sponsored athlete, and personal trainer Taylor Chamberlain offers some tips for rocking a muscle-building phase in your workout program. Perhaps the most important element of a successful muscle-building phase for women is taking in more calories. "Do not be afraid to eat!" says Chamberlain. "I spent years trying to accomplish a more muscular physique, putting in hours and hours into weightlifting and cardio, and being very careful what I ate. Little did I know, I wasn't eating enough to fuel my muscles." To generate new muscle tissue, your body needs additional energy, above and beyond what you need to maintain your current body weight. In short: No calories, no growth. "It was only after a year of reverse dieting—increasing my calories at a slower rate over time, lifting heavier than usual, and eliminating my cardio—that I finally saw the changes in my lean mass," Chamberlain says. When most people start a muscle-building phase, they typically go one of two ways: They try to gain as little body fat as possible, often sacrificing their muscle development, or they throw caution to the wind, eat everything in sight, and just accept the fat gain that comes along with it. Neither of these strategies is ideal: Better to strive for gaining a little body fat along the way to maximize your lean mass gains. "Everyone is different, but I would say a good rate to aim for is 10-15 pounds of muscle over a year," suggests Chamberlain. "It's impossible to achieve results without gaining a little fat mass along the way, so it's best to just expect it." Women often tend to move toward the extreme diet end of the scale. Some even try to lose fat while they try to build muscle, which is a difficult, if not impossible, task. Increase calories, but do it carefully! You need to eat to gain muscle mass, but how much? "I suggest finding your maintenance calories by tracking in MyFitnessPal (or another food log) for three consecutive days, then taking the average of those days," says Chamberlain. "From there, increase your calories by 500. Keep slowly increasing by 80 or so calories every other week." This example of reverse dieting can help you increase your metabolism without adding more calories all at once. "If you suddenly increase your daily calories, your body won't know what to do with them except store them as fat," she says. Slowly adding the calories to your meal plan helps your body grow used to processing them. Having achieved your ideal rate of weight gain, you can maintain your calorie level until your weight gain slows or you reach your goals. Lately, the term "macros" has received a lot of attention in the fitness and health communities. For every woman trying to lose weight, there's another tracking the amount of macronutrients (protein, carbohydrates, and fats) they consume. Unlike the weight-loss craze, attention to macros is a great trend because it allows you to be more precise with your nutrition and, therefore, see better results. "I suggest a meal plan consisting of 40-percent carbohydrate, 30-percent protein, and 30-percent fat," suggests Chamberlain. "Your daily protein intake should equal about 1 gram per pound of body weight." Another common notion is that you need to be super lean before you start focusing on building muscle. Some women mistakenly believe they need to diet down to near single-digit body-fat levels before they can begin to focus on building muscle. It's very unhealthy for a woman to have body fat in the low teens for more than a short period. And unless you're an elite competitor, reaching this extremely low level of body fat is exceptionally challenging. On one hand, you don't want to be carrying an extra 30-40 pounds of fat when you decide to build muscle. On the other hand, Chamberlain says, "being extremely lean can throw off your hormone production, your ability to recover after intense exercise, and your energy levels. You need some body fat to both function well and to gain lean muscle mass." Any number of workout plans can help you gain muscle mass. "I recommend choosing a workout split slanted toward whichever muscle groups you have a hard time growing," suggests Chamberlain. "Let's say your glutes take a lot of stimulation and volume to grow, while your quads grow if you even look at them. Train your glutes twice per week and cut back on your quad exercises." She notes that for optimal growth, you should target that muscle group twice per week. As for cardio, Chamberlain says "it's great for overall heart health, but during a grow-focused period, I'd keep it to a minimum." When you do intense cardio training, you're eating into your recovery and energy reserve that could have been better spent focusing on heavy weight-lifting exercises. As with having the right amount of body fat, using the right supplements can help you gain lean mass. 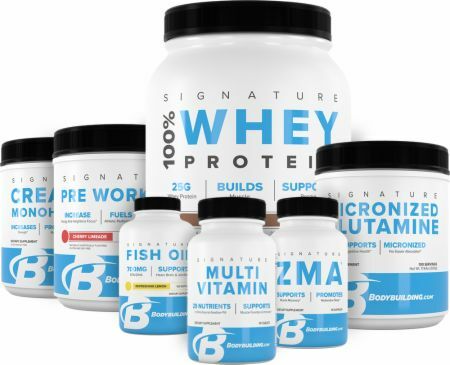 "The top supplements I recommend—and what I use myself—are creatine, beta alanine, whey protein powder, fish oil, and a multivitamin." You can see great results by combining your multivitamin and fish oil in the morning at breakfast, then taking a pre-workout product and creatine before your workout to amplify your performance. Then, you can follow up your daily workout with a whey blend and glutamine for a speedier recovery, and finish your day by taking ZMA (an acronym for zinc, magnesium, and aspartate) right before bed to improve sleep and speed recovery. This daily supplement protocol is just another step you can take to reach your goal of adding lean mass to feel stronger and more confident!